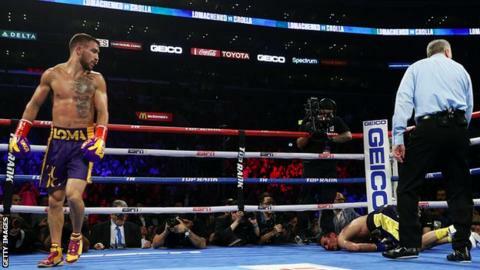 Britain's Anthony Crolla was stopped in the fourth round by WBO and WBA lightweight champion Vasyl Lomachenko in Los Angeles. The fight was waved off after Crolla went down 58 seconds into the fourth round from Lomachenko's hard right hook. "Anthony's fine. Obviously it was a heavy knockout - a temple shot he didn't see," promoter Eddie Hearn told Sky Sports. "After he was counted out he got up and was fine. But he's devastated. He said: 'I'm just so gutted for the team because of the work they did'. I'm like: 'Don't worry about the team, you just fought the pound-for-pound number one'. You're mandatory challenger, what else are you going to do? You get a shot at Lomachenko, you've got to take it. But he was just too good. "This shot came against the head; you can't not take this opportunity. Losing to Lomachenko is never a disgrace. Two-time Olympic gold medallist Lomachenko improved to 13-1 with 10 knockouts. But Lomachenko dominated throughout, his right hook sending Crolla crashing to the canvas early in the fourth round. Crolla dropped to 34-7-3 after a poor performance against overwhelming favourite Lomachenko - who called out his next opponent after the win: "I want Mikey Garcia. I want to unify titles. That's my goal. I want historic fights," Lomachenko said. Before the fight, Crolla told BBC Radio 5 Live's boxing podcast that he wanted to "shock the world." He faced criticism for taking the fight after the WBA and WBO world lightweight champion's original opponent - IBF champion Richard Commey - withdrew because of injury.